Supporters of the alternative projects "Bus-Bunn", "BTB" and "Lux Heli Shuttle" rejoiced today as rumors spread that the government was no longer supporting Luxtram. Their joy, however, did not last very long. "We're not choosing one of the known alternative projects, either", a spokesman clarified. "After decades of discussion we noticed we had missed one crucial option." He continued to explain that all proposed rail projects either had the tracks running through tunnels or at street level. Both options have significant disadvantages, particularly when considering older voters passengers: Subterranean stations would scare them while the tram could not manoeuvre around obstacles, leading "to an enhanced injury risk". Only one lane is blocked on the street for two elevated tracks. No scary tunnels and easily vandalized subway stations. Special open-air cars could replace annoying tourist buses. Lux-MRT by Stephan Lechner is licensed under a Creative Commons Attribution-Share Alike 3.0 Luxembourg License. Finally, the Lux-MRT also solves the Schueberfouer issue: While the tram would split the funfair in two, thereby ending this 5000 year old tradition, a "permanent roller-coaster-like segment" could be built for the Lux-MRT, bringing "fun and excitement" into the passengers' daily life. Lux-MRT causes no interference on traffic? Are you considering the road space it will take up? Or do you think that the thousands of cars that drive through the roads will suddenly stop? I don't see much logic in this. And to say that the tram would hinder the traffic is preposterous as in many other cities in Europe like Amsterdam have these running up and down the city along with other forms of traffic with no problems in safety. 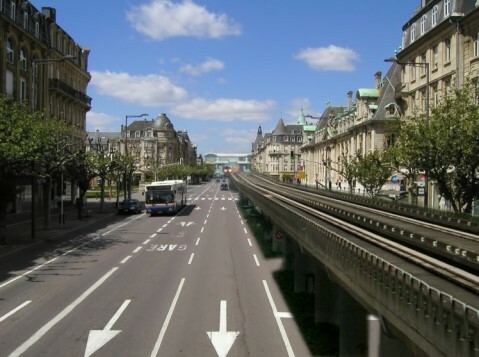 And the tracks for this Lux-MRT do damage the cityscape. It's a protruding track, how can you fail to see it completely brakes with the traditional look of the roads? With trams, this is indeed a non-issue. Did no-one recognise the date of this report? You are viewing a static archive of the second incarnation of this blog. The very first one can be found here. Click here to visit my current blog.